In this great deal. You get all three of the beginning games together in a studio licensed bundle. A piano has 88 keys, we have 10 fingers, this means finding where to put your hands can sometimes feel pretty difficult for young beginners. I can't count the number of times I've received a midweek text asking "where do we put our hands for X song?" (and I love getting those, honestly, because it means someone is practicing! So keep the questions coming) What this does tell me is that the work & reminders we do on finding positions in lessons isn't always quite enough for students to feel confident finding it again on their own. So, this week's game "Hands Down!" gamifies the skills & routine necessary for young students to place their fingers on the keys with confidence. 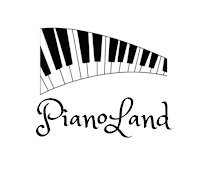 This week's beginning piano game I've just always called "Piano Land." And it's one of my go-to games for working on keyboard navigation because it uses the actual keyboard as the playing field. So students are learning their way around all 88 keys, and having fun doing it. 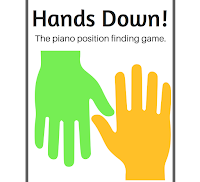 For piano parents, this is a terrific, and easy, game that you can play with your child, or that siblings can play together to enhance practice time. I hope you all enjoyed our Ship Shape Pianist series, and found some inspiration & motivation to set up 2018 as a productive year of piano study! Heading into February, I thought I'd switch focus to something a little less business-y and a bit more fun. Huzzah! So, this month, I'll be sharing a series of beginning piano games that can be played at home (or in lessons) to supplement early piano study. And the best part, this first one is a free printable! 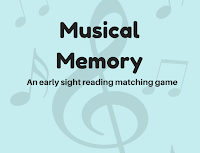 This game is a classic - a Memory Matching game for music. I started making versions & variations of this game by hand almost as soon as I started teaching 12 years ago, and I have found it to be a very versatile teaching tool that can be played alone, one on one, or in a small group. It can be a great reinforcer of general music knowledge & early theory concepts without making a student feel like they're being drilled. Not to mention, it increases spatial memory, which is so important when playing the piano.